Do your kids love stuff toys? Doggie boy, my middle child, absolutely loves Ruffles the stuffed brown bear. He inherited it from me when he was born. This was my favourite bear which accompanied me while I was studying abroad in Australia back then when I was a teenager. Fast forward to today, this seventeen year old bear is being coveted by Doggie boy and he hugs it to sleep every night. It has become his must have comfort item. To keep Ruffles clean and it’s fur soft and nice we use Comfort Ultra Pure in the wash when we do the laundry. It lets you experience pure softness. Using it makes your laundered clothes feels baby cottony soft against your skin like silk!! It feels like you are wrapped in love. It is made with a specially formulated formula for delicate and sensitive skin which has been supported by British Skin FoundationHaving young kids at home I know how important it is to use a softener which will not result in them suffering from rashes due to an allergic reaction. Having used this product for nearly a year the 3 kids haven’t had any issue with the laundered clothes with none of them breaking out with rashes from our our term usage. It delivers impeccable softness and has a long lasting fragrance of up to 14 days.Comfort Ultra Pure is the only softener which I have used that has its fragrance last for days after being taken out of the laundry. Most of the time by the next day the soft scents would have vanished and the items like towels would become stiff after constant rewashing. Using Comfort Ultra Pure I am glad to see that my towels remain soft and fragrant wash after wash. Comfort Ultra Pure is really easy to use and add to the wash. It only takes a minute or so to add the softener to the load before starting up the washing machine. Doggie boy has been helping to wash the clothes as part of his Holistic Learning. He knows first hand how the clothes are put to wash and which receptacle to put the washing detergent and softener inside. 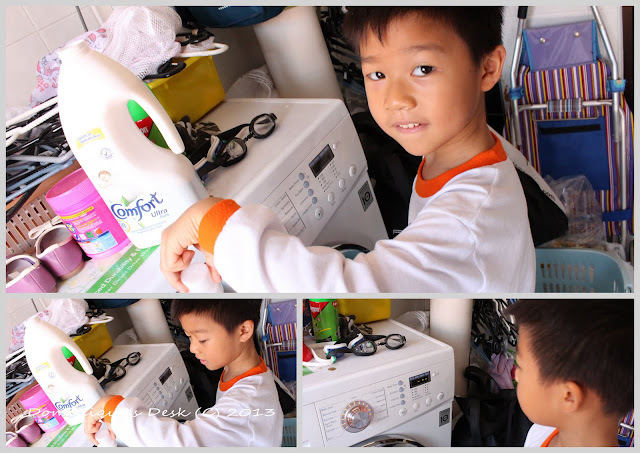 The kids take turn to do the laundry at home. When it is his turn he will measure out half a cap of Comfort Ultra Pure to pour into the slot before switching on the machine to start the wash. When the laundry is done, Ruffles comes out the wash smelling all nice and clean. Doggie boy would then patiently wait for it to be fully dry before Ruffles is able to rejoin him in bed. How do you keep your kids stuff toy soft and nice? My son loves stuff toys. He loves Mickey, Pooh, Barney, Teddy bear. I don’t know if that Comfort Ultra Pure is already available here. We are using the other brand of Fabric Conditioner, but I want to try that Comfort as well. It helps us reduce our electric bill since I don’t need to iron our clothes. That’s such a gigantic teddy bear!